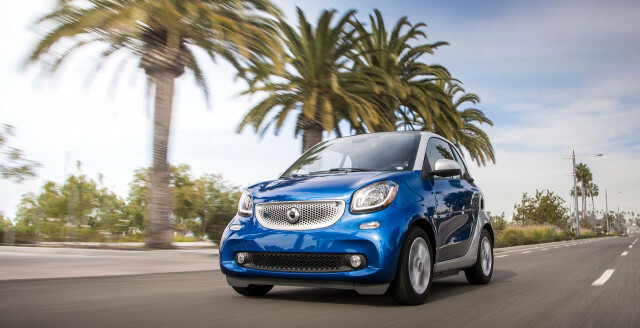 The Smart Fortwo is a very small coupe or convertible that's powered exclusively by electrons. Its small size is a boon to parking and maneuverability, but not necessarily battery capacity. It's rated for only 58 miles by the EPA, which is the shortest range electric car on sale. For 2018, parent-company Mercedes-Benz looked for a new approach as it axed the gasoline-powered Smart models in favor of a battery-only lineup. It makes Smart the only other manufacturer besides Tesla to offer a battery-only offering, although the two companies are very different. Versions in 2019 were identical to the year before it. The Fortwo, which has been offered in coupe, cabriolet, and electric models, has the distinction of being the smallest highway-legal car ever sold in the U.S. Though the little Smart has now been on sale in the U.S. for 10 years, it hasn't sold particularly well and its chief rival in the U.S., the Scion iQ, is no longer available. The Smart Fortwo was redesigned for 2016, the first complete redesign the model has received since the brand was launched in 1998. It continues to be a two-door coupe with a small rear hatch, plus a new Cabriolet model that arrived for 2017. That soft-top Smart features a special “Tritop” roof that can be configured three ways: fully open, fully closed, and partially open, like a large sunroof. The power roof takes just 12 seconds to retract, and it can be operated with the keyfob, although the side bars must still be removed by hand. The new generation of Smart Fortwo holds fast to a length of slightly less than 9 feet long, but it's roughly four inches wider. The tiny proportions give the Fortwo the best turning radius, at 22.8 feet curb to curb, of any car on the market. The short length means it will continue to slot into the smallest of parallel spaces, while the increased width will be welcomed by full-size Americans who found themselves cheek by jowl inside the older model. The profile hasn't changed much either. The latest Fortwo has the same snub nose, perky styling, and clearly defined passenger compartment, with wheels pushed out to the corners and side styling accented by the contrasting color. Design features carried over from the previous Smart include the prominent shoulder line, frameless door windows, and a split tailgate whose upper portion opens for access while the lower half flips down to provide a temporary surface. The front end is definitely more defined and bulbous than before—partly a result of tougher pedestrian-safety requirements. The interior is a bit more visually interesting than in the previous models, but still fairly simple. Two eyeball vents sit on top of the dash, and a small instrument cluster behind the wheel contains the usual gauges. A touchscreen display sits slightly proud of the central console, and overall, the interior has a far more substantial feel. The base Pure model (offered only in coupe guise) includes power windows, central locking, LED daytime running lights, cruise control, power steering, and audio and other controls on the steering wheel. The audio system includes a CD player, Bluetooth streaming for playing music and hands-free commands. The instrument cluster includes a 3.5-inch color display, and a trip computer and an exterior temperature display are also standard. Beyond that, the Passion, Prime, and Proxy trim levels provide a mix of different features, using interior trim and fittings to give the different models distinct characters. Infotainment options in the Fortwo lineup include smartphone integration and a navigation system with real-time traffic and weather data. The Smart Cross Connect app allows owners to access their car and other useful functions while away from the vehicle. A top-end JBL sound system with eight speakers and a 240-watt amplifier should provide substantial sound for the small cabin. The ForTwo Electric Drive will do 0 to 60 mph in 11.4 seconds, while the Cabrio takes 11.7 seconds, according to Smart. Top speed for both models is limited to 81 mph. After years of hesitation and false starts, Smart launched the Fortwo in the U.S. in 2008, right into the teeth of a gas crisis. It sold like gangbusters in its first two years, but the numbers fell drastically in the years after that, averaging about 10,000 units a year. The versions of the Fortwo that are being phased out in 2016 were powered by a 70-hp, 1.0-liter Mitsubishi 3-cylinder gasoline engine that was mated exclusively to a 5-speed automated manual. Dimensions were slightly different, along with various changes in materials, trims, and switchgear, but U.S. Smarts kept the rear-engine, rear-wheel-drive configuration. When gently driving and not zipping, the transmission could be obstinate, lurching between gears in indecision. Performance wasn't that impressive if you went by the specs: 0-to-60-mph times were a leisurely 13 seconds or so. The attributes that made the first Fortwo so appealing in the city conspired to make it less so—and in some cases even a little scary—on the highway. Engine and road noise were excessive at freeway speeds, and while the Smart could cruise at 70 mph or even 80 mph, no one wanted to stay at those speeds for long. The short wheelbase and rather tight suspension calibration that helped it feel so responsive, albeit a little jittery, in the city made it bouncy and busy at higher speeds—it was especially sensitive to crosswinds, while grooved pavement caused noticeable tramlining. Packaging in the Smart could take some getting used to at first, but it was a brilliantly space-efficient car. Overall, it felt like sitting in a small, exceptionally narrow pickup cab, though a quick look ahead and behind could evoke a sense of vulnerability. This Fortwo performed quite well in crash tests—for its size—and came with stability control, side airbags, and ABS. A comprehensive interior freshening came in 2011, with a few new features added to the stark cabin decor—at the request, Smart said, of buyers. For 2013, the mildest of upgrades included updated front and rear styling, and moving the Smart badge from the hood to the center of the grille. Smart offered a handful of Electric Drive cars for lease in 2011. These versions used a low-power electric motor and lithium-ion battery packs from the then-startup Tesla Motors, of which Daimler used to be a shareholder. The Smart ED carried a hefty lease bill and had only 63 miles of range to a charge according to the EPA. Many of the original Electric Drive cars have migrated to Car2Go fleets that are stationed in large cities. In 2013, the Smart Electric Drive arrived with a new all-electric powertrain. At roughly double the price of the cheapest gasoline Smart Fortwo, it's the least expensive plug-in electric car sold in the U.S. It's also much nicer to drive than the gasoline version, because its single-speed transmission dispenses with the lurching, thudding automatic shifts that make the gasoline car such an amusement-park ride. The electric Smart performs as well as the gasoline version—its acceleration is actually slightly quicker—and qualifies for a $7,500 federal income-tax credit and a $2,500 California purchase rebate, meaning an effective price after incentives of only about $15,000. In some ways, it's the car that the Smart Fortwo should have been all along, as the small car is best suited to short trips in the city anyway. The Electric Drive carried on with the old body style in 2016, but an all-new model using the new Fortwo is to be introduced in late 2016 and will likely arrive in the U.S. as a 2018 model.